The earth belches and spews forth her fury. as you hiss and ooze red-hot anger. glass-sharp edges of your hardened crust. as we retreat to cooler ground. Posted in response to the Daily Post Photo Challenge: Beneath Your Feet. Photos from our 2005 Lava Walk on the Big Island in Hawaii. A once in a life-time experience, to feel the volcano beneath our feet! The awesome reach of nature and our respect for it must never wane. How beautiful and appreciative your words are of this awesome force (when active). 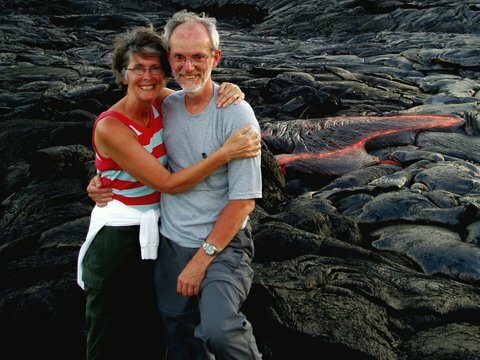 You and your husband look exceptionally relaxed and peaceful – lava can’t melt happy. It truly was an amazing walk – took all our kids before they had kids :). We walked back with flash lights and could see the lava flowing in the darkness. This volcano is still active and was the one that made news a while back, slowly creeping toward the town of Pahoa. Don’t believe they do the lava walks anymore. It was truly breathtaking. I’m so glad you experienced that with your family – how wonderful!